If it came with a scratch ’n’ sniff sticker, “Watch the Throne’’ would smell like a shiny new car. A Rolls-Royce, to be exact. Everything about the album has the regal air of luxury, from the gold-plated artwork to the lyrical references to extreme wealth to the outsize personalities who made it. And that title! 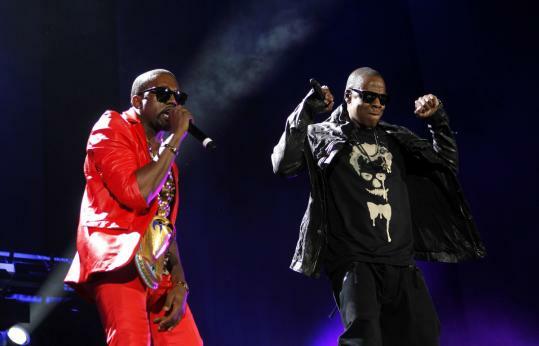 Only Kanye West and Jay-Z, two rock stars masquerading as rappers, could get away with that. The message behind their new album together couldn’t be more pointed: Please step aside as Jay-Z and West keep a close watch over their kingdoms. And now their two kingdoms have become one. When West and Jay-Z come to TD Garden on Monday, they’re bringing with them not just the marquee hip-hop event of the year, but also a juggernaut tour that proves just how supreme the genre reigns. As of Wednesday, tickets were still available for the Garden show, but there’s a good chance it will sell out. “If they price it right, hip-hop shows do well here,’’ says Tricia McCorkle, spokesperson for TD Garden, adding that the venue routinely hosts the annual Monster Jam concert (including this year’s show on Nov. 30 featuring Drake and Wiz Khalifa). But West and Jay-Z are arguably the only duo in rap who could pack arenas night after night. Earlier this year Lil Wayne, fresh from prison, took Nicki Minaj and Rick Ross on the road with him, but the tour didn’t carry the same kind of heft. West and Jay-Z have been working together for at least a decade - West was one of the producers of Jay-Z’s “The Blueprint’’ in 2001 - and collectively their draw is vast, well beyond the 18-to-34 demographic. Their new album together has spawned a few hits on urban radio, including “Otis’’ and rising single “[Expletive] in Paris,’’ but it hasn’t quite crash-landed into mainstream awareness. That’s beside the point, though. They don’t need a smash hit to rally their fans. It’s not as if no one saw Frank Sinatra in concert just because his latest wasn’t No. 1 on the charts. Pup Dawg, music director for JAM’N, says other artists might appeal to a broad fan base, but no other pairing has the history that West and Jay-Z share. He sees their collaboration as a testament to each artist’s longevity. “It shows you that old hip-hop is still around. People think that the music has gone very mass appeal, and it has, but Jay and Kanye are still doing what they’ve been doing for years,’’ he says. Tickets for the Garden show top out at $247.50, but if you consider the caliber of the artists, that’s not extraordinary. Like it or not, that’s a common price range among heavyweights, regardless of genre. Certainly, Madonna and the Rolling Stones have done it. And when Carole King and James Taylor teamed up for a tour together last year, tickets went for as much as $350. The success of the album and tour trumpets a commercial peak for rap, but it also raises a critical question of just how far the genre has strayed from its streetwise origins. Pollstar’s Bongiovanni says West and Jay-Z’s recent two-night stand in Atlanta raked in more than $2 million. Maybe that’s why the two moguls recently took some heat for their support of Occupy Wall Street. West visited with protesters, and Jay-Z was criticized because his Rocawear fashion line was selling T-shirts that read “Occupy All Streets’’ without donating any of the proceeds to the cause. Given their annual incomes, it’s safe to say these guys are not exactly among the 99 percent. Then again, there’s a fine line between making money and feeling empathy for those who don’t.